Here’s the third of fifty installments on “lessons learned leading 35 years of wilderness ventures.” Please feel free to leave a comment. It greatly enriches the discussion. You are also encouraged to subscribe to this blog by checking the box at the bottom of this entry. Before I start #48 I’d like to share that a number of people have asked me if I have already determined the fifty lessons learned. The answer is yes. When I planned the presentation mentioned above I came up with the list and then when I decided to create these blog entries I put them in priority order from 50 to number 1. People have also asked me what number 1 is and I’ll tell you what I told them. You have to wait and see. I may tweak the list as I move forward but I expect it to remain substantially the same. #48 – Cross-country skiing with a full pack is a different sport than any other form of skiing and is damn hard work. With late fall here and snow in the air it seems appropriate to talk about skiing. I learned to downhill ski during the winter of 1967-68 in the Snowy Range near Laramie, WY and took up cross-country skiing in 1972 here in the Adirondack Park. At the age of 23 it was kind of a late start, especially compared to our children’s generation who learned to ski about the same time they could walk. Cross-country skiing was not ingrained in American outdoor recreation in the sixties and seventies like it is now. It wasn’t until around 1978 that I did my first real backcountry skiing and met some people that were doing amazing things on skinny skis. (Pretty much all x-c skis were still skinny then) Metal and fiberglass skis were available then but wood skis with lignostone edges were still the standard and I remember my first day at our small local downhill ski area learning to telemark ski on such skis. Steve Barnett’s book titled, “Cross-Country Downhill and other Nordic Mountain Skiing Techniques” had recently been published and we were all trying to teach ourselves how to telemark ski. Someone once said you need to fall 1,000 times to learn to telemark ski. I think we were well on our way on that winter afternoon on Mt. Pisgah in Saranac Lake, NY. 1976 - My first pair of non-wooden skis. During the first of sixteen winter practicums I led at North Country Community College, my assistant instructor Doug Fitzgerald and I were learning as much as the students. Although I was a veteran of a number of extended winter expeditions, at that point I had never outfitted and led 10 novice winter campers before. Our equipment was a hodgepodge of new, used, and improvised. It wasn’t ideal but I thought it would keep us safe and relatively comfortable. Most of our skis had been Eastern Mountain Sports rental skis so they were well used and they certainly weren’t designed for novice skiers carrying heavy packs. We quickly learned that they wouldn’t cut it on our trip that included one week of snowshoeing and one week of cross-country skiing. (The story of that trip would be a long blog entry in itself.) By the next year we were looking for more durable and heavy duty skis, boots, and bindings. Each year, weather permitting, we had a couple of x-country ski lessons at the college before we headed out and we would plan itineraries that minimized steep terrain but it was still a tough transition for the students to carrying heavy packs with a week’s worth of food and all the necessary gear to keep you safe and comfortable in temperatures down to minus 35F. We developed a number of routines that helped us. When we got into camp we took off our leather ski boots, brushed off all the snow, cleared the binding pin holes of any snow or ice, made sure the laces were loose, put them in a stuff sack and left them there until they were needed again. We scrapped down our skis, particularly the bindings, so that snow and ice didn’t set up like cement by the next morning. In camp we wore two pair of polyester booties with over boots which kept our feet toasty warm. In the morning we had “boot time”. No one was allowed to put on their leather ski boots until everyone was ready. That eliminated people from standing around in subzero temperatures with leather boots on. Once everyone had their boots on we skied like hell for about twenty minutes to make sure everyone’s feet were warm. 1984-Survival Skiing with a heavy pack - Nice Technique! What was the skiing like? 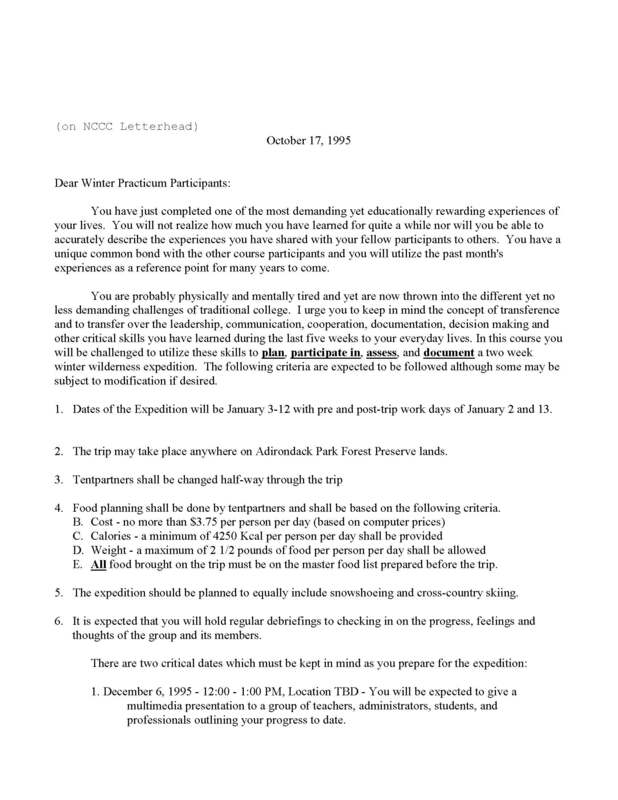 Well I once read an article about a NOLS winter mountaineering course (Full disclosure – I’m a graduate of three NOLS courses – 1970 Wilderness Course, 1971 NOLS Mt. McKinley Expedition, 1974 NOLS Instructors Course) where skiing with a pack was described as “survival skiing”. It is a very apt description. The goal is very simple. Not to fall down. The amount of energy expended to get up in deep snow with skis on and a heavy pack is phenomenal. If you fell it was not unusual to look like a turtle on its back, virtually impossible to get up without assistance. The students learned that it was generally easier for novice skiers to plan to go up the steeper hills rather than have to ski down them and designed their itineraries accordingly. During the course of our trips we generally had the students move camps frequently for environmental reasons but also because you learn so much every time you have to look for, find, set up, and break camp. The exception to that was in the winter when students were still learning to ski. Having layover camps allowed them to take day trips during their layover days and improve their skiing technique so that when they had to ski with heavy packs it was easier. It was also an excellent physical conditioner. A welcome addition to our equipment was climbing skins. I remember the year before we acquired climbing skins, we had a five mile trip that included a two mile up-hill climb that because of the steepness and deep snow took us nearly all day to complete. By the time the students got to camp they were really spent. The following year all the students had skins and we climbed the same hill in less than half the time and arrived in camp fresh. What a world of difference. We found kicker skins worked well for our purposes. Having one sled per two-person tent group (or two per three-person tent group). These guidelines seemed to work for us. Have the right equipment. It makes the difference between having fun and being miserable. Take care of your gear, in this case your skis, boots, and bindings. The winter is extremely tough on equipment and most backcountry equipment is not designed for the freezing and thawing that occurs on a daily basis over a two-week expedition. Ski technique with a heavy pack is all about minimizing falling. It drains tremendous amounts of energy to have to get up in deep snow with a heavy pack on your shoulders and skis on your feet. For novice skiers it is generally easier to go uphill rather than downhill and is also less dangerous.